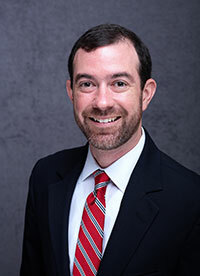 Gould Hagler is an Augusta native who began his insurance career at Sanford, Bruker & Banks in 2009. A graduate of Aquinas High School (2002) and Mercer University (2006), Gould always knew he wanted to settle in Augusta to be close to his family. Gould has been involved in a variety of different organizations since he moved back to Augusta in 2007. He is the Past Vice President of the Imperial Theatre, and currently serves on the Board of Directors for Sacred Heart Cultural Center and on the Board of Trustees for Historic Augusta. He is also a member of the Rotary Club of Augusta and a Paul Harris Fellow. Gould is a triathlete, having completed the Augusta Ironman 70.3 4 times, and an avid outdoorsman.